Just A Car Geek: Ariel Atom - "No Doors, No Roof, No Compromise"
Ariel Atom - "No Doors, No Roof, No Compromise"
There is nothing I can say that will be any more revealing or insightful than the video and websites below. Click here to see a YouTube video of Top Gear's test of this car. Click here to find the US website. 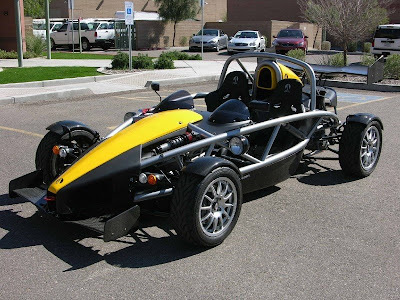 Click here to find an Ariel Atom for sale on eBay. And yes, this car can be made street legal. "To be street-legal, an Atom must be built as a kit car. That means everything, including the engine, is shipped to the owner in pieces. An optional road pack, which includes turn signals, a horn, rear tail lights and headlamps, is also available. The owner assembles the car in his own garage, being sure to follow all appropriate, state-mandated vehicle safety guidelines. Otherwise, the Atom is sold as an off-the-road-only vehicle -- not legal on the highway, but perfectly comfortable at the local track." You really can't look at this as a car. It's more of an adult go kart or a motorcycle with 4 wheels. Whatever. I don't know that I want to own one of these, but I'd love to drive one once, just for the experience.